It seems to me that not many developers use hardware trace? ARM indicates that maybe only <5% of developers are using trace. Too bad! Why are all the ARM Cortex microcontroller vendors putting a powerful hardware (and complicated!) trace engine into their devices, if only few developers are using it? Seems like a waste of silicon and an unnecessary price adder? Well, hardware trace can be a life saver: Because only with hardware trace the most complicated bugs and problems can be solved. And maybe because only the best are using it ;-). Maybe few engineers are using hardware trace because most don’t know about it? Or because it requires a decent hardware probe to capture the trace date to get reasonable results for high-speed targets? Or because ARM for whatever reason has implemented the hardware trace in their devices in a way which is hard to understand, and the documentation about it is distributed all over the place and hard to understand and read? As for myself, I have found it very difficult to gather all the needed information to get trace out of the NXP TWR-K64F120M board. But as always with difficult things: have learned a lot new things that way :-). I have used occasionally hardware trace with the Freescale CodeWarrior for MCU 10.x, and it worked very well. Then this was replaced by the Kinetis Design Studio and it did not had hardware trace included. Because most of my boards anyway did not had a trace port, and I used it occasionally only, this was not a big deal for me. And it seems it was the same for most users of CodeWarrior: apart of a few voices in the communities, there was no outcry about hardware trace not supported in Kinetis Design Studio. However, recently I have faced issues with DMA and interrupts where hardware trace is an effective tool to get enough data out of the system to understand what is going on and to narrow down the problem. A trial-and-error approach is otherwise all what remains. I have now solved my problem with the help of ETM trace and a Segger J-Trace. But it took me a while to get into the topic of hardware instruction trace and to have my Kinetis configured to get all the data I needed. In this article I describe what I had to do to get ETM (Embedded Trace Macrocell) instruction trace out of an NXP TWR-K64F120M board. 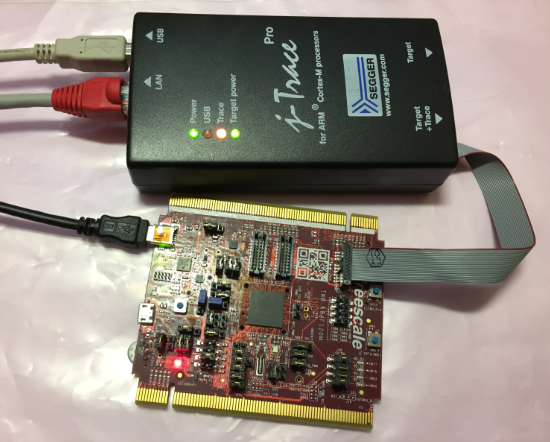 In “First Steps with Ozone and the Segger J-Link Trace Pro” I used the Segger Ozone to trace an STM Cortex-M which was included as demo board with the Segger J-Trace for ARM Cortex-M processors. 💡 I have used the Segger Ozone Debugger because the Kinetis Design Studio does not support hardware trace. See above note. I used Ozone ‘only’ to get the trace data, everything else (project, build) is still done in Eclipse (KDS). 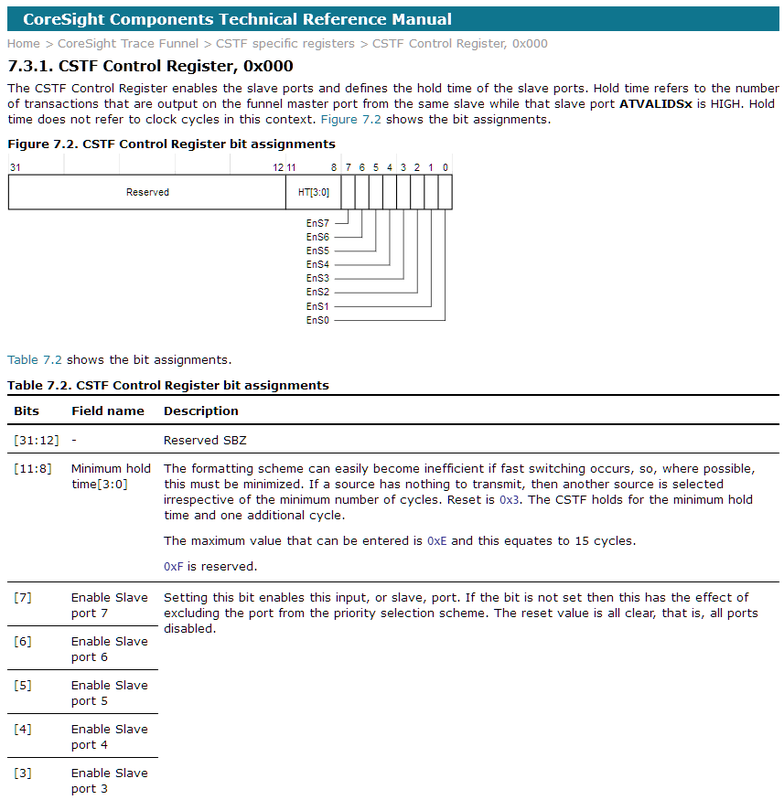 Understanding trace means reading the ARM CoreSight information on Arm.com. Unfortunately that documentation is more oriented for silicon engineers, and not much for software engineers. The documentation is full of acronyms which are hard to remember. I hope I got them right, as there seems to be no consistent and reasonable-to-understand (at least to me) description from either the different vendors (NXP, STM, TI, …, they all refer to the ARM documentation) and from ARM (their information is written more for silicon designers and not for software engineers). ITM: Instrumented Trace Macrocell, hardware block which allows tracing using software instrumentation, e.g. writing to special ports to send trace messages out. A common usage is sending text messages over SWO, see “Tutorial: Using Single Wire Output SWO with ARM Cortex-M and Eclipse“. Another usage is generating messages for interrupt entry/exit and for periodical program counter (PC) sampling. 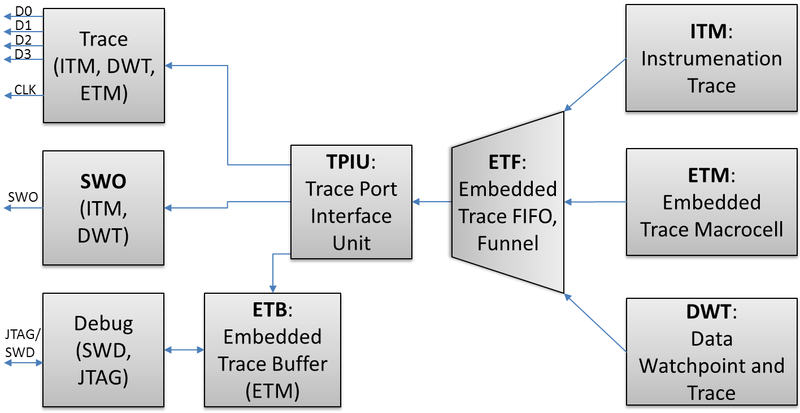 ETM: Embedded Trace Macrocell, hardware unit responsible to generate hardware instruction trace. ETB: Embedded Trace Buffer, instead of sending trace out on physical pins, this unit is responsible for storing trace messages in internal RAM. The trace then can be retrieved with normal memory access e.g. with a SWD or JTAG debug unit. DWT: Data Watchpoint and Trace, hardware unit responsible for generating trace for data access. SWO: Single Wire Output, hardware pin which is able to send ITM and DWT trace messages to the outside. SWV: Single Wire Viewer, trace protocol and format generated by the ITM. This includes character/serial encoding for UART, interrupt entry/exit messages and PC sampling. ATB: Advanced Trace Bus, trace bus protocol used by ARM to internally send trace messages over the trace bus. SWD: Single Wire Debug, debug interface with reduced pin count (data and clock). These acronyms will be used later in this article as we have to configure them to get trace out. While it is possible to get trace using ETB and a RAM buffer plus a normal JTAG/SWD debugger, this won’t work well for faster trace data. For this, a probe with hardware trace is needed. Such a probe is the Segger J-Trace (see “First Steps with Ozone and the Segger J-Link Trace Pro“). I recommend to use the LAN port and to use the USB port to power the trace unit. I could use the on-probe memory to capture the trace, but only the probe LAN port is able to stream the data fast enough to the host PC. These trace pins are not available on Cortex-M0(+). And they are not available on many boards because the pins are used for other things like GPIO. It seems to me that rarely board designers are willing to spend the needed pins for hardware trace. And the problem gets bigger with the lower pin counts: which board designer is willing to sacrifice up to 5 pins for hardware trace on a device with say 48 pins or less? The other issue is that because the data rate and clocks on the trace pins can be very high, they need special layout considerations too, so chances are low that the board designer is willing to spend the extra effort to give the software developer the trace he needs. Maybe software has no bugs? ;-). As shown in the schematics, the trace pins (CLKOUT, D0-D3) are shared with normal GPIO pins (PTE0-PTE). As a board designer I have to make sure the pins are not used for anything else. Additionally I need to be careful that the clock and data lines of trace are as short as possible and are not influenced by noise. * Note: Using ETM and ETB  with SWO cannot co-exist, as using the same data channel. The first one configures the GPIO pins, the second enables either ETM or ITM, or both. To illustrate the different settings, I’m showing them in the EmbSysReg View. This completes the pin and trace configuration needed to get trace with the J-Trace and the Ozone debugger. Getting instruction trace out of an ARM Cortex-M4 is probably not the simplest thing in the world. I had to configure both the GPIO pins plus the trace module to be able to get instruction trace with the Segger J-Trace probe. In case you don’t own a trace probe, there is a cool way to get trace data with a general purpose logic analyzer, then have a read http://essentialscrap.com/tips/arm_trace/theory.html which presents a way to decode the trace data with the sigroc data deocder (cool stuff!). This entry was posted in ARM, Boards, Cortex, CPU's, Debugging, Embedded, Freescale, Kinetis, Tips & Tricks, Tutorial, TWR-K64F120M and tagged ARM ETM, arm gcc, CoreSight, Debugging, J-Trace, Kinetis, NXP, Segger, technology, Thoughts, Tips&Tricks, Trace, TWR-K64F120M by Erich Styger. Bookmark the permalink. Thank you for a great description. I’ve always wanted to get it to work but I always run into an issue and don’t end up using it. Could you please explain cases when a trace is the only/best/fastest way to figure out your problem? I don’t know when it is worth the effort to get it setup. I have used it in the past for Linux os debugging with the green hill debugger. Basically, trace provides you a full history what happened. So it is extremely helpful for cases where a sequence of interrupts or events lead to a problem. For example I had a problem where critical sections where not working properly (see https://mcuoneclipse.com/2014/01/26/entercritical-and-exitcritical-why-things-are-failing-badly/). Only in a particluar sequence of interrupts and very timing sensitive the problem occurred. With hardware instruction trace I was able to have things recorded up to the point where the system caused the fault, so I had the sequence of instructions leading to the problem point. Going back the sequence of instructions I saw what was happening, and very soon I spotted that problem. With normal debugging such a problem would be very hard to find. I would say that maybe 95% of the bugs can be found with normal debugging. But for the rest of the problems hardware trace can be extremely helpful. But it requires practice, and still debugging the hard-to-find problems needs experience and good tools. And good tools can save your from days of debugging in the dark. Great article – and good question you ask – how do we manage now days without trace capability?. 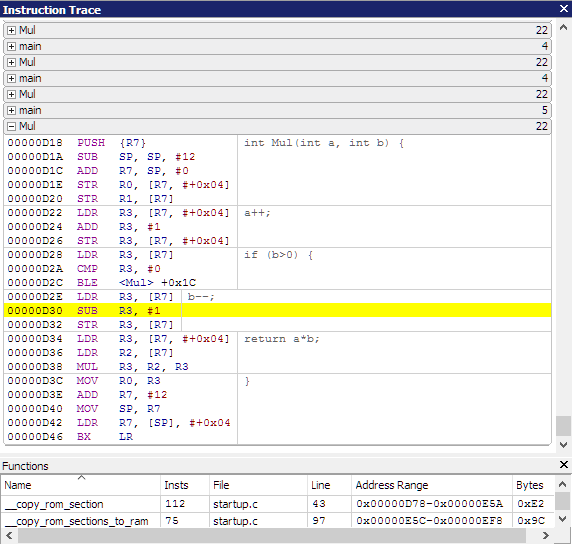 I’ve used trace extensively when it was part of expensive emulator/debuggers before the days of JTAG. In those days there was scarce hardware resources, think 1 system 10 sw engineers booking time on it 18hrs a day. Expensive projects!!. Since 2000 the style of embedded systems code development has changed to have plentiful low cost hardware available, and I’ve fought in projects for each embedded sw developer to have their own development system. This has allowed sw developers to test more thoroughly their code base, and layer it, and overall improve project time to completion. Now there are software driver specialist in interfacing to the hardware with a desire to abstract the hardware layer. One such project is an embedded USB – https://github.com/felis/UHS30 with one option at the hardware level for kinetis series FS host. We do have puzzles at times as to what is the interaction between hw and dma and have to try some options and read the manuals. The software supplied by silicon vendors also demonstrate how to access drivers, and combined with source code management like GIT make it easier to manage the quality and track from a working driver to when it fails, and provide a bug fix. So those 5% of sw engineers using it are probably critical to getting a working base system. Still if the trace interface was easily available for a low cost for early stages of debugging drivers I think more people would use it. As an expensive $option (not least because of the cost of developing the software to extract and display the trace) it remains the province of a productivity tool for budgeting into new projects. Of course if the good GDB angels work some open source magic, then its cost to the rest of us will fall to that of the components. Thanks for the excellent article, I need to try and make those pins available in my next hardware board in case I need them later :). Thanks 🙂 ! I have used expensive trace hardware units for devices which had only a very minimal hardware debug capability (BDM, Background Debug Mode) compared to the ARM CoreSight debug block. And it was used with full emulation system and/or bondout version of the chips. These days inexpensive boards are available and make things much easier. I agree with you with the hardware abstracted away, the developer probably does not care about trace. Still it would be useful as information provider for profilinig and coverage. And I’m surprised how few developers on embedded are using profiling and coverage information. I think because not many seem to use trace these days, coverage in the tools like Eclipse and GDB is rather minimal: the GDB angels work on the items they need the most, and that’s basically ‘normal’ debugging. But this opens up a door for the good tool vendors our there to provide something as a differenciator. I had previously thought that Trace Debug using the ETM would be Plug and Play like JTAG or SWD, I think its safe to say this article would have avoided disappointment for me. The JTAG adapter has dropped significantly in price over the years but I expect trace tools won’t be super cheap any time soon due to hardware cost and low volume production. Would be awesome if there was a way to graphically view Instruction trace data. At least for me, it was definitely not plug&play. Probably because many more users are using JTAG/SWD, the vendors have made it easy for all of us. The good thing with SWD/JTAG is that these pins are available on the boards, so broadly supported. I have found that only few NXP boards and from other vendors have the trace pins available. E.g. all the FRDM boards from NXP which are very popular do not have the trace pins available. 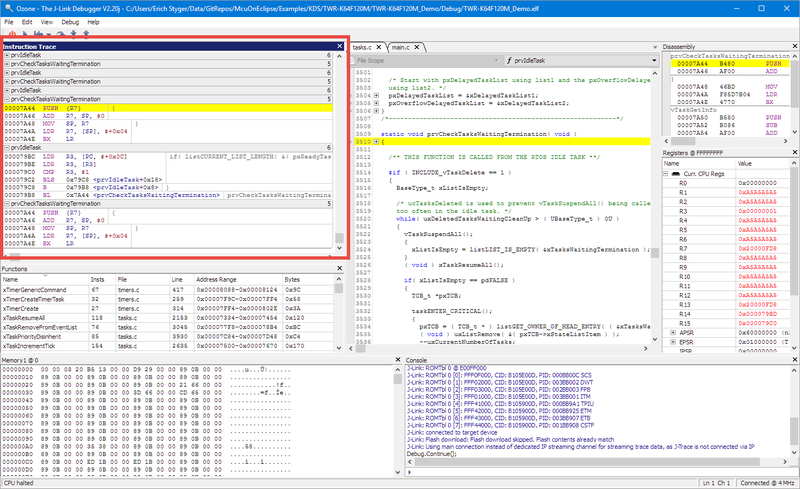 CodeWarrior had a graphical view of the trace timeline view (see https://mcuoneclipse.com/2013/04/07/first-steps-with-the-pe-tracelink/). I would love to see a graphical view like the Segger SystemView with the function trace in there too. From the recent NXP press release, can we expect “trace” to be reintroduced into the KDS replacement next year? 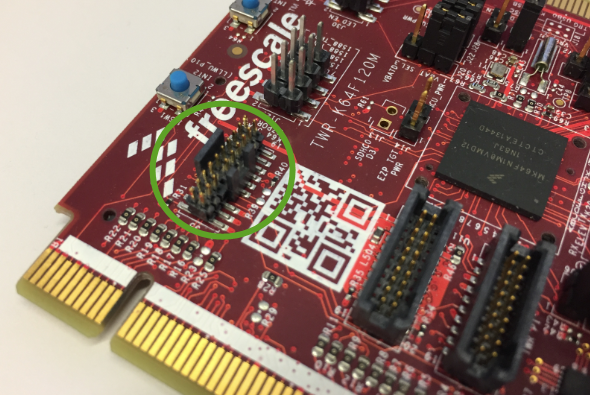 You hit the issue on the head for us: Our EEs only lay out the 10 pin header on all our boards: Combination of pins, board space, and connector cost (on many boards they use the pogo-pin Tag-Connect system which as developers we hate but manufacturing likes). I’ve tried to convince them to at least put the full 20pin on at least Rev A boards if the pins are available and maybe switch to the 10 pin tag-connect only when we get to a board rev that we’re confident is going to production but so far we haven’t had success. yes, I made the same mistake as most of the evaluation boards only have 10 pins, so adding the trace pins for a hardware oriented engineer does not make sense. For the software development access to trace is the only way to solve complex problems in a reasonable time frame. While I agree with the sentiment that trace is definetly under-used, there often is a lot of work involved in getting it implemented. Especially if you aren’t running the top-of-the-line MCU and have a much smaller derivative that doesn’t even have the hardware pins routed to pin packages. In that case you’re basically stuck with either porting your code to an evaluation board or using some type of SWD/JTAG trace. But information on that is incredibly scarce.